So Tai Shan's gearing up to move out of his folks' place and head to the land of his forebears. Before he leaves on his special FedExPanda Express plane, though, the National Zoo is throwing him a fitting farewell. Known far and wide (meaning from Southeast to Northwest, obviously) as Butterstick, he's getting a fitting photo tribute from butter company Land O'Lakes, reports DCist. 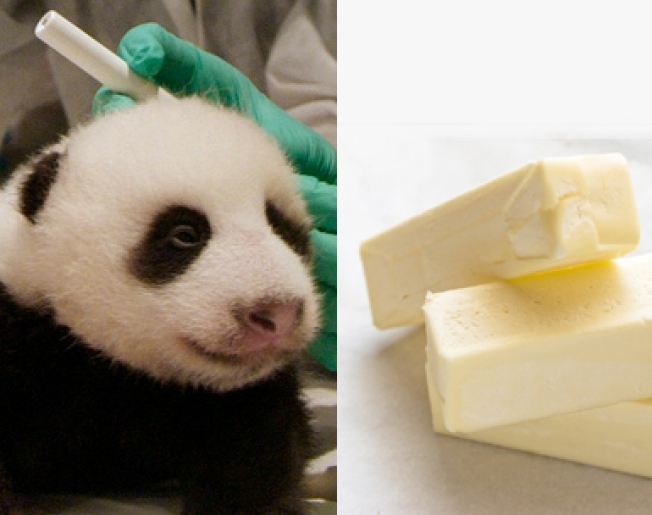 Guess there is some benefit to being born the size of, well, you know... a stick of butter. The Zoo's shindig is Saturday from 11 a.m. to 3 p.m. at Olmsted Walk and Panda Plaza. You can also personalize Tai Shan memory cards (maybe he'll read them on the plane?) and view the Tai Shan travel timeline. Oh, and snap up panda-themed merch, of course. Because it's not an event without a trip to the gift shop at the end.